Harrisburg Municipal Center is located at 10 North Market Square, Harrisburg PA 17101; phone: 717-255-3060. Photo: William Maclay Mansion, ca. 1792, Front and South Streets, Harrisburg, PA. Listed on the National Register of Historic Places in 1976. Photographed by user: Smallbones (own work), 2013, [cc-by-3.0 (creativecommons.org/licenses/by/3.0)], via Wikimedia Commons, accessed December, 2013. Harrisburg is the Pennsylvania State Capitol and the Dauphin County Seat. Incorporated as a borough in 1791, it was named for its founder, John Harris. Harrisburg was chartered as a city in 1860. Harrisburg, on the east bank of the Susquehanna River at the head of the Cumberland and Lebanon Valleys, is the capital of Pennsylvania and the seat of Dauphin County. The city is entered from the west on two toll bridges. Upon the island-studded river are paddle-wheel dredges mothering small barges that remove culm (coal dust and coal refuse) for industrial use from the shallow stream. The river's eastern shore has been made into a concrete esplanade with a series of levels descending to the water's edge. On the bluff above this walk is a long and narrow park paralleled by Front Street, a thoroughfare of fine houses. From the east the city is approached by a broad viaduct guarded by two towering pylons. It spans the streets and railroad tracks below, and leads to Capitol Hill. To the south is the industrial section: steel and rolling mills, builders' supply yards, and the automobile district. All incoming roads lead to the capitol or Market Square, center of the downtown area, busy with the traffic of thousands of State workers who make Harrisburg their weekday home. The weekends, however, return the city to its permanent residents and visitors. When the assembly is in session it brings an influx of State senators and representatives, delegations, attorneys, lobbyists, and news correspondents. Hotels do a rushing business, and the street corners about Capitol Hill become outdoor caucus chambers. On Market Street east of the Square the department and chain stores join forces with the Nation-wide 'five-and-tens' to supply the needs of Saturday crowds from the neighboring countryside. A few blocks north of the Square is the capitol group. North of Maclay Street lies an attractive residential section of detached houses and terraced lawns. Abutting the city on the southeast is the suburb of Steelton, considered by many as industrial Harrisburg. The area around Harrisburg was originally called Peshtank or Peixtan (swampy) by the Indians, later corrupted to Paxtang. The discovery of arrowheads, stone hatchets, pieces of crockery, beads, and numerous skeletons indicates that a large Indian village once existed here. John Harris, a Yorkshireman, licensed in 1705 as an Indian trader, settled at Paxtang about 1712 and established a trading post and ferry. Here a son and namesake was born in 1727. In October 1736 the Penn heirs through treaty with the Indians acquired a deed 'for all the said River Susquehanna with the land lying on both sides thereof,' thereby validating a provincial government grant made to Harris in 1733. The settlement was early known as Harris' Ferry after the ferry across the river had become an important link in travel to the West. The son continued to operate the ferry after the elder Harris died. The Enabling Act of 1791 developed Harrisburg first as a canal and then as a railroad center. Proponents of the act demonstrated to the legislature that more than 150,000 bushels of grain had been brought down the Susquehanna River to Middletown, much of it on the Juniata River from the territory beyond the mountains. The committee then pointed out how much more could be transported if the western end of the State could be connected with the Susquehanna and Delaware Rivers by a system of canals. The Pennsylvania Canal was projected in 1826 and, with the railroad from Columbia to Philadelphia, was completed in 1834. Meantime, in 1812, Harrisburg had become the State capital; this stimulated trade; and the accessibility of coal and the proximity of iron deposits in Dauphin and Cumberland Counties led to new industrial development. Railroads followed the course of the old canals and eventually replaced them as common carriers. A car-building shop and large reclassification yards were established to meet the growing needs of the Pennsylvania and the Reading Railroads. 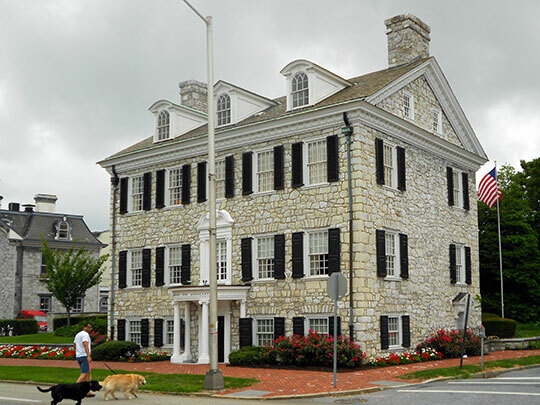 Harrisburg, with a population of 13,000, was incorporated as a city in 1860. During the Civil War the first concentration camp for Union forces was established here and named Camp Curtin in honor of the governor. In the summer of 1863 an advance guard of Lee's army approached within sight of the city, only to turn back at the last moment when the Confederates decided not to invade the Susquehanna Valley. The economic depression that followed the war had its ill effects on industry, but by the latter 1870's the city was again in stride industrially, with a population of more than 25,000. In February 1897 a fire of uncertain origin destroyed the capitol. Fire also leveled, in 1907, the Grand Opera House where Harrisburg theatergoers had enjoyed the performances of such noted artists as Edwin Booth, Joseph Jefferson, Mary Anderson, and Mrs. John Drew, and where notable State political conventions had been held. The twentieth century ushered in an era of civic and municipal improvements. Millions were spent on sewers, street paving, parks, and bridges. State office buildings were and still are being erected; apartment houses are springing up to relieve the housing problem; and new residential sections are being developed in the suburbs. Works Progress Administration Writers' Program, Pennsylvania: A Guide to the Keystone State, 1940, Oxford University Press, New York.